Progesterone therapy has been practiced for over 50 years in the treatment of a wide variety of symptoms and diseases that are hormonally related. During this time no adverse side affects have been reported. Some people have benefited from it continuously for over 30 years. There is no evidence to suggest it is possible to overdose using progesterone therapy. Hormones are chemical messengers and can only work once inside the nucleus of a cell. To get into the nucleus the hormone needs a carrier which is called a receptor. Receptors are very specific, they will only transport the hormone for which they are made. Progesterone receptors will not transport the synthetic progestogens into the cell nor will they transport progesterone itself if there is adrenalin in the blood. The level of progesterone varies in women from approximately 5mg per day in the first half of the monthly cycle up to 50 mg per day in the second half. During pregnancy the placenta produces up to 40 times the highest amount made when not pregnant. Men make from 5 to 15mg per day on a continuous basis. Progesterone therapy is usually administered in a cream or oil base, which means that it will be carried in the blood on a red blood cell membrane. Often tests only check the plasma which would show up little or no progesterone. So what can you do for reliable results? Saliva tests are generally more reliable. However, if you are a woman and if a blood test is your only option then make sure this is done during the 5 to 10 days before your next period. 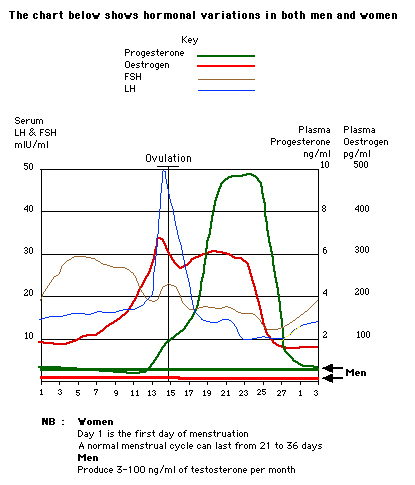 This is to check whether ovulation has occurred, as the level should then be at its highest point. ...please click here for a specialist's comments. A blood test is not a necessity. Simply trying progesterone therapy and seeing its effectiveness in dealing with your health problems is the easiest course of action as it is inexpensive and risk free. See here for full details on progesterone application methods. When using progesterone therapy it is essential to start on a high dose. Some practitioners give 2500mg/day for very severe cases of post natal and manic depression, PMS, panic attacks, temporary psychosis etc. After the initial high dose, which should bring relief in anywhere from three days to three months, it may gradually be reduced until the reappearance of symptoms. This indicates the level of progesterone needed. As it is the precursor to the stress hormones any extra stress will require increased levels of progesterone therapy. Please note the amount suggested is a guide only as each individual is different. It's only by trial and error that the correct amount is found. Another point to remember is that stress drops progesterone levels sharply so apply more to prevent the return of symptoms. Progesterone should always be used dependant on symptoms and not on 'dose'. If symptoms are severe more will be needed, if mild then less. Please note... The figures below showing quantities of progesterone cream are based on a concentration of 3.33% progesterone as is the case with a 2oz (60 gram) tube of Natpro cream containing 2000mg (2 grams) of progesterone. Use from 10 to 100mg/day of progesterone (that is 0.3ml to 3 ml of cream). It's best applied twice a day. Important note for women... If you have been on HRT (hormone replacement therapy) or have a naturally high level of estrogen, progesterone will make you more sensitive to the estrogen in your body. Because of this, for the first two or three months the symptoms caused by excessive estrogen may affect you. If this is the case it is advisable to increase the daily application of progesterone cream, with the advice of your health specialist, until these symptoms have gone. For more information on what are often, but wrongly, perceived as progesterone side effects click here. An elevated progesterone level induces an increase in body temperature. Women can measure their temperature by using a thermometer. A rise in progesterone is indicated by about a 0.4 degree Fahrenheit increase and a fall of progesterone, triggering menstruation, indicated by a decrease in temperature. A thermometer can also help in determining if you are progesterone deficient during pre-menopause years. (Post menopause women are not ovulating and menstruating and have constantly low progesterone levels so progesterone level changes will not occur.) Your temperature should rise at ovulation and remain high until a day or two so before the end of the cycle and the start of menstruation. Fluctuations may occur due to a "double ovulation". Although this is rare it is possible within three days of initial ovulation or due to sickness. If your temperature never rises (indicating no ovulation) or consistently drops several days after ovulation and stays low for days thereafter it is very probable that your progesterone levels are not being adequately maintained. Low progesterone levels can contribute to miscarriages and osteoporosis and numerous other symptoms of estrogen dominance. To verify your findings the only reliable method is saliva hormone testing. "...saliva hormone testing is more convenient, less stressful, more cost-effective, and more representative of the bioavailable fraction of hormones in blood than serum hormone testing. When hormones are delivered topically, serum hormone testing grossly underestimates the bioavailable fraction of hormones in blood and tissue hormone uptake and response..."
To read more and to find out why the saliva test is the only reliable one please click here. Some drugs may be dispensed with once progesterone therapy has been started, most notably the anti-depressants. Always taper off slowly and with the advice of your health specialist. Any additional stress, good or bad, can cause your symptoms to recur. If this should happen then increase the daily application until they have gone. If you would like to find out more about progesterone therapy please click here.